It's not easy to build a lighthouse: workers and engineers must work hard, facing waves and storms, to raise the towers that can grant safety to thousands of people who sail the sea. 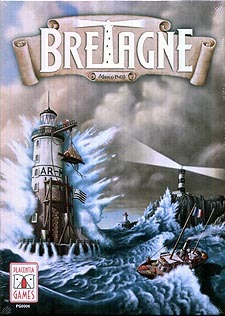 In Bretagne you have this important task and you must manage at best every aspect of the works: obtaining resources, hiring skilled personnel, choosing barges or placing sirens, furnitures, docks or cableways on the lighthouses. During the game you will have to send workers on the market, on port, or in the construction site and manage your money and resources at best, to score more points than your opponents, passing from a choice to another, in a game where nothing happens accidentally.